Austin has been the capital of Texas since 1839, and in 2013 the area became the nation’s capital for population growth, according to U.S. Census Bureau estimates released on May 22, 2014. Austin itself gaining more people (nearly 21,000) than any city with fewer than 1 million residents. In terms of numeric growth, 13 of the 15 cities that added the most people between 2012 and 2013 were in the South or West, except for New York City, which ranked first in numeric population growth. The nation’s largest city, New York, added 61,440 people in the year ending July 1, 2013. 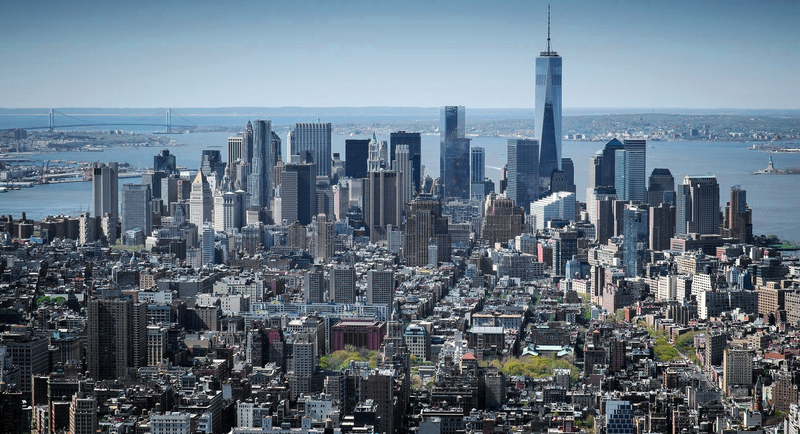 New York continued to be the nation’s most populous city by a wide margin, with 8.4 million residents in 2013, followed by Los Angeles and Chicago. The list of the 15 most populous cities has remained unchanged since last year, aside from Indianapolis moving past Jacksonville to number 12. The U.S. Census estimates that Birmingham grew by 672 people between July 2012 and July 2013 and had a population of 212,113. The city of Birmingham had a population of 340,887 in 1960. Huntsville is estimated to have grown from a population of 183,775 on July 1, 2012 to a population of 186,254 by July 1, 2013. The city had a population of 139,282 in 1970. Montgomery is estimated to have decreased in population from July 1, 2012 when its population was 204,573 to a July 1, 2013 estimated population of 201,332. Montgomery had a population of 205,764 in 2010. In 1980 the city had a population of 177,857. In 1960 the city of Montgomery had a population of 134,393. Mobile is estimated to have grown from a population of 194,888 on July 1, 2012 to a population of 194,899 by July 1, 2013. The U.S. Census estimates that Anchorage grew from a population of 298,294 on July 1, 2012 to a population of 300,950 on July 2, 2013. Phoenix is estimated to have grown by 24,843 people to have a July 1, 2013 population of 1,513,367. Little Rock grew from 196,661 on July 1, 2012 to 197,357 in July 1, 2013. Fort Smith grew from 87,591 on July 1, 2012 to 87,650 in July 1, 2013. Fayetteville grew from 77,015 on July 1, 2012 to 78,960 in July 1, 2013. Los Angeles grew from 3,852,782 on July 1, 2012 to 3,884,307 in July 1, 2013. Los Angeles had a population of 2,816,061 in 1970. San Francisco grew from 827,420 on July 1, 2012 to 837,442 in July 1, 2013. This is the largest population of the city in its history. San Diego grew from 1,337,029 on July 1, 2012 to 1,355,896 in July 1, 2013. San Jose grew from 982,579 on July 1, 2012 to 998,537 in July 1, 2013. Sacramento grew from 475,367 on July 1, 2012 to 479,686 in July 1, 2013. Oakland grew from 401,230 on July 1, 2012 to 406,253 in July 1, 2013. This is the largest population Oakland has ever had. The city had a population of 384,575 in 1950. Fresno grew from 505,736 on July 1, 2012 to 509,924 in July 1, 2013. Fresno had a population of 217,129 in 1980. Denver grew from a population of 634,542 on July 1, 2012 to 649,495 in July 1, 2013. Denver had a population of 492,365 in 1980. This is largest Denver has been in population. Colorado Springs grew from a population of 433,570 on July 1, 2012 to 439,886 in July 1, 2013. Hartford decreased in population from July 1, 2012 when it had a population of 125,164 to decline to a population of 125,017 in July 1, 2013. Hartford had a population of 177,397 in 1950, which was its largest population. Wilmington had a population of 71,292 on July 1, 2012 and is estimated to have grown to 71,525 as of July 1, 2013. Wilmington’s largest population was in 1940 when it had 112,504 living within the city limits. The city of Washington in the District of Columbia added 13,022 people between July 1, 2012 and July 1, 2013 to reach a population of 646,449. In 2000 Washington had declined to a population of 572,059. The city of Washington had a population of 802,178 in 1950. Miami grew from a population of 414,221 on July 1, 2012 to an estimated population of 417,650 by July 1, 2013. This is the largest population the city of Miami has ever had. In 1980 the population was 346,865, that was up from 334,859 in 1970. Miami only covers 55.27 square miles (143.1 km2). Jacksonville is the largest city by area in the contiguous United States includes all of Duval County. The city government consolidated in 1968. Jacksonville is estimated to have grown from 836,608 on July 1, 2012 to 842,583 by July 1, 2013. Tampa grew from a population of 348,701 on July 1, 2012 to an estimated population of 352,957 by July 1, 2013. Orlando grew from a population of 250,159 on July 1, 2012 to an estimated population of 255,483 by July 1, 2013. Atlanta is estimated to have grown in population since its July 1, 2012 population of 443,505 to an estimated population of 447,841 by July 1, 2013. The city had its largest population in 1970 when it reached 496,973. The city had declined to 394,017 in 1990. Columbus is estimated to have grown from a population of 198,701 on July 1, 2012 to an estimated population of 202,824 by July 1, 2013. Augusta’s citizens in 1995 voted to merge the city with Richmond County the city is estimated to do have decreased from a population of 197,976 on July 1, 2012 to an estimated population of 197,350 by July 1, 2013. Macon is estimated to have decreased in population from on July 1, 2012 when the population was 91,176 to an estimated July 1, 2013 population of 89,981. Macon’s largest population was 1970 was 122,423. Savannah is estimated to have increased in population from 142,364 on July 1, 2012 to and estimated July 1, 2013 population of 142,772. Savannah’s largest population was 147,537 in 1960. By 1970 the city’s population had decreased to 118,349. Honolulu’s population is estimated to have grown from 344,997 on July 1, 2012 to 347,884 in July 1, 2013. Boise grew from an estimated population of 212,237 on July 1, 2012 to an estimate population of 214,237 by July 1, 2013. The city of Chicago gained just under 6,000 residents in the year that ended July 1, 2013. This is well below the growth in most other big American cities. According to new estimates released by the U.S. Census Bureau, the population of Chicago proper grew to 2,718,782 on July 1, 2013 up 5,862 since July 1, 2012, or about 0.2 percent. The city’s population has increased by about 23,000 since the 2010 census, or just under 1 percent. Chicago had a population of 3,620,962 in 1950. Indianapolis is estimated to have grown from a population of 834,843 on July 1, 2012 to an estimated population of 843,393 by July 1, 2013. Fort Wayne is estimated to have grown from 254,688 on July 1, 2012 to 256,496 by July 1, 2013. Evansville is estimated to have grown from 120,129 on July 20, 2012 to 120,310 by July 1, 2013. Des Moines is estimated to have grown from 206,765 on July 1, 2012 to an estimate population of 207,510 by July 1, 2013. Wichita is estimated to have decreased in population from 385,316 on July 1, 2012 to an estimated population of 386,552 by July 2, 2013. Topeka is estimated to have decreased in population from 127,989 on July 1, 2012 to an estimated population of 127,679 by July 1, 2013. Louisville-Jefferson County is estimated to have grown from 604,990 on July 1, 2012 to 609,893 by July 1, 2013. Lexington-Fayette is estimated to have grown from a population of 305,252 on July 1, 2012 to a population of 308,428 by July 1, 2013. New Orleans continues its steep population climb toward pre-Hurricane Katrina levels. The Crescent City gained 8,800 people from July 2012 to July 2013. The 2013 population of 378,715 in New Orleans represents 83 percent of the city’s estimated population of 455,000 in August 2005. The population growth rate of New Orleans since 2010 is 10.1 percent as of July 1, 2013. The largest population the city was was in 1960 when it reached 627,525. Baton Rouge is estimated to have decreased from a population of 230,006 on July 1, 2012 to an estimated population of 229,426. Shreveport is estimated to have decreased in population from 202,066 on July 1, 2012 to an estimated 200,327 by July 1, 2013. Portland is estimated to have increased in population from 66,218 on July 1, 2012 to 66,318 by July 1, 2013. Baltimore is estimated to have decreased in population from 622,417 on July 1, 2012 to an estimated population 622,104 by July 1, 2013. Baltimore had a population of 949,708 in 1950, it’s largest. By 1970 the population of the city was 905,759. Boston continues to increase in population from 637,845 on July 1, 2012 to an estimated population of 645,966 by July 1, 2013. The city’s largest population was 801,000 in 1950. Detroit’s population continues to fall, despite pockets of growth in areas such as downtown and Midtown. The population estimate shows that Detroit remains the nation’s 18th most populous city, with 688,701 residents as of July 1, 2013. That’s down about 10,000 from 2012. The city of Detroit had a population of 1,849,568 in 1950. Grand Rapids is estimated to have increased in population from 190,414 to and estimated population of 192,294 by July, 2013. The city had a population of 197,800 in 2000. U.S. Census reports that Flint dropped below 100,000 residents for the first time in nearly a century. Flint had a population of 100,412 on July 1, 2012 to decrease to an estimated population of 99,763 on July 1, 2013. The city had its largest population in 1960 when it reached 196,940. Minneapolis has once again crossed over the 400,000 population mark. The city is estimated to have grown from a population of 392,768 on July 1, 2012 to a population of 400,070 by July 1, 2013. The city had a population of 521,718 in 1950. The city declined to a population of 434,400 in 1970 and its lowest decline was 368,383 in 1990. St. Paul is estimated to have increased in population from 291,039 on July 1, 2012 to 294,873 by July 1, 2013. The city’s largest population was in 1960 when it reached 313,411. Jackson’s population continues to decrease from 175,195 on July 1, 2012 to an estimated population of 172,638 by July 1, 2013. The city had a population of 202,895 in 1980. St. Louis, once the largest city in the state, continues to decrease in population 319,112 on July 1, 2012 to an estimated population of 318,416 by July, 1, 2013. The city had a population of 856,796 in 1950. The metropolitan area population,on the other hand, for this city is still the state’s largest. Kansas City continues to be the largest city in the state and is estimated to have grown from 464,299 on July 1, 2012 to 467,007 by July 1, 2013. Kansas City had its largest population of 507,087 in 1970. Billings is estimated to have increase in population from 107,079 on July 1, 2012 to an estimated population of 109,059 by July 1, 2013. Omaha is estimated to have increased in population from 428,850 on July 1, 2012 to a population of 434,353 by July 1, 2013. Las Vegas is estimated to have increased in population from 596,178 on July 1, 2012 to 603,488 by July 1, 2013. Henderson is estimated to have increased in population from 265,285 on July 1, 2012 to 270,811 by July 1, 2013. 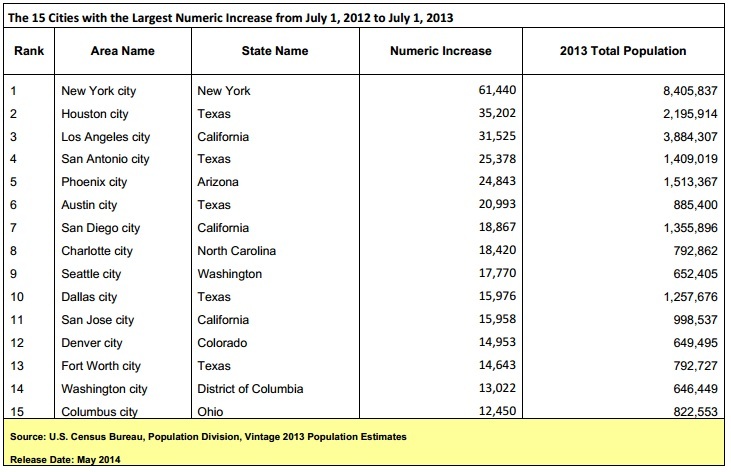 Reno is estimated to have increased in population from 230,667 on July 1, 2012 to 233,294 by July 1, 2013. Manchester is estimated to have increased in population from 110,313 on July 1, 2012 to 110,378 by July 1, 2013. Newark is estimated to have increased in population from 277,625 on July 1, 2012 to 278,427 by July 1, 2013. The city saw its largest population in 1950 when it reached 438,776. Albuquerque is estimated to have increased in population from 554,621 on July 1, 2012 to 556,495 by July 1, 2013. New York City gained 61,440 people between July 1, 2012, and July 1, 2013, according to the U.S. Census Bureau, for an estimated population of 8.4 million, a record for the city. New York City is by far the most populous in the nation, followed by Los Angeles, with an estimated 3.8 million residents, and Chicago, with 2.7 million, according to the bureau’s population estimates for cities and other incorporated places nationwide. Buffalo, home to an NFL and NHL franchise, continues to decrease in population from 259,387 on July 1, 2012 to an estimated population of 258,959 by July 1, 2013. The city had a population of 580,132 in 1950. 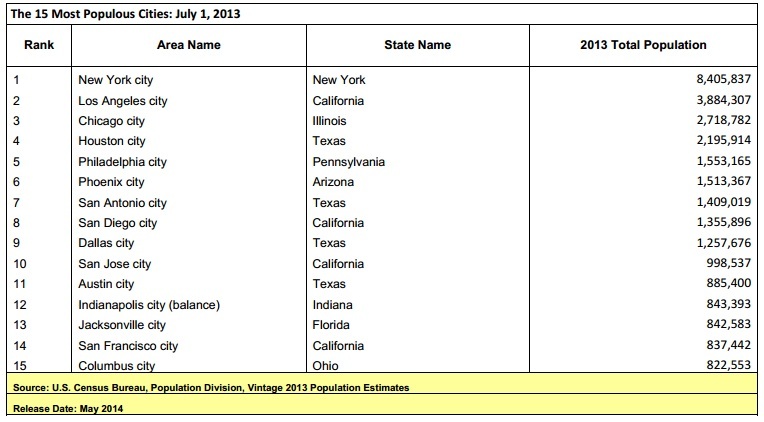 Rochester is estimated to have decreased in population from 210,515 on July 1, 2012 to 210,358 by July 1, 2013. The city had a population of 332,488 in 1950. Charlotte is now the nation’s 16th most populous city, new census estimates. Charlotte gained more residents than all but seven other cities between 2012 and last year. Its population stands at an estimated 792,862 people. Charlotte had a population of 315,474 in 1980. Raleigh is the 2nd largest city in the state and is estimated to have grown in population from 423,338 on July 1, 2012 to 431,746 by July 1, 2013. Greensboro is the 3rd largest city in the state and has grew from 276,566 on July 1, 2012 to an estimated population of 279,639 in July 1, 2014. Durham continues to be the state’s 4th largest city and grew from a population 239,633 on July 1, 2012 to an estimated population of 245,475 in July 2013. Winston-Salem is estimated to have increased in population from 234,322 on July 1, 2013 to 236,441 by July 1, 2013. Fayetteville is estimated to have grown from 201,834 on July 1, 2012 to a population of 204,408. Wilmington is the largest city in eastern North Carolina and is estimated to have grown from 109,874 on July 1, 2012 to a population of 112,067 by July 1, 2013. Cary continues to be the 3rd largest city within the Raleigh-Durham area with having increased in population from 145,794 on July 1, 2012 to a population of 151,088 by July 1, 2013. In 1970 the city had a population of 7,640. High Point is estimated to have grown from a population of 106,678 on July 1, 2012 to a population of 107,741. Asheville is estimated to have increased in population from 85,993 on July 1, 2012 to an estimated population of 87,236 by July 1, 2013. Chapel Hill continues to grow in population from 58,949 on July 1, 2012 to an estimated 59,635 by July 1, 2013. Apex, once a small town in the Raleigh-Durham area, has grown from 40,460 on July 1, 2012 to a population of 42,214 by July 1, 2013. In 1980 the city only had a population of 2,847. Concord, located in metro Charlotte, continues to increase in population grown from 82,105 on July 1, 2012 to an estimated population of 83,506. Kannapolis is estimated to have increased in population from 43,766 on July 1, 2012 to 44,359 to July 1, 2013. Huntersville is estimated to have increased in population from 49,267 on July 1, 2012 to 50,458 by July 1, 2013. Fargo is estimated to have increased in population from 110,142 on July 1, 2012 to 113,658 by July 1, 2013. The largest projected drop was for Cleveland, falling 6,702 residents (1.7 percent) from the census in April 2010 to 390,113 at the point of the new estimate, which is for July 2013. Cleveland had a population of 914,808 in 1950. The region continues to be the state’s largest metropolitan area in terms of population. Cincinnati is estimated to have grown by 732 people between July 1, 2012 and July 1, 2013 to a population of of 297,517. Cincinnati had a population of 503,998 in 1950. Columbus continues to increase in population growing from and estimated population of 810,103 on July 1, 2012 to 822,553 by July 1, 2013. Dayton is estimated to have increased from 143,258 on July 1, 2012 to 143,355 by July 1, 2013. The city’s largest population was 262,332 in 1960. Toledo had is estimated to have decreased from a population of 283,302 on July 1, 2012 to 282,313 by July 1, 2013. The city’s largest population was 383,818 in 1960. Akron’s population is estimated to have decreased from 198,622 on July 1, 2012 to 198,100 by 2013. The city had a population of 290,351 in 1960. Oklahoma City is estimated to have increased in population from 599,679 on July 1, 2012 to 610,613 by July 1, 2013. Tulsa is estimated to have grown from a population of 394,349 on July 1, 2012 to 398,121 by July 1, 2013. Portland has increased in population from 603,026 on July 1, 2012 to and estimated population of 609,456 by July 1, 2013. Philadelphia is the 2nd largest city on the East Coast and continues to grow. This city is estimated to have grown from 1,548,647 on July 1, 2012 to 1,553,165 by July 1, 2013. The city once had a population of 2,071,605 and decreased to 1,517,550 in 2000. In estimates released this morning, the Census Bureau said there were 348 fewer people living in the city on July 1, 2013, than on July 1, 2012. The new population estimate is that there are 305,841 Pittsburgh residents, meaning the change is statistically insignificant at just 0.1 percent. Pittsburgh had a population of 676,806 in 1950. Providence is estimated to have decreased in population from 178,247 on July 1, 2012 to 177,994 by July 1, 2013. The city had its largest population of 253,504 in 1940. Columbia is estimated to have increased in population from 132,094 0n July 1, 2012 to 133,358 by July 1, 2013. This is the largest population the city has seen in its history. Charleston is estimated to have grown in population from 125,635 on July 1, 2012 to 127,999 by July 1, 2013. North Charleston is estimated to have grown from a population of 102,003 in July 1, 2012 to 104,054 by July 1, 2013. Greenville has grown in population from 60,746 on July 1, 2012 to 61,397 by July 1, 2013. Spartanburg is estimated to have grown in population from 37,486 on July 1, 2012 to 37,647 by July 1, 2013. Rock Hill, is located within the Charlotte, North Carolina metropolitan area and continues to grow from an estimated population of 68,258 on July 1, 2012 to 69,103 by July 1 2013. Sioux Falls is estimated to have increased in population from 160,230 on July 1, 2012 to 164,676 by July 1, 2013. Nashville-Davidson is continuing to increase in population from 624,993 on July 1, 2012 to 634,464 by July 1, 2013. Memphis is estimated to have decreased in population from 654,556 on July 1, 2012 to 653,450 by July 1, 2013. Chattanooga is estimated to have grown from 172,304 on July 1, 2013 to 173,366 by July 1, 2013. Knoxville is estimated to have grown from 182,200 on July 1, 2012 to 183,270 by July 1, 2013. Houston gained more residents last year than any American city except New York City. Houston gained about 35,000 residents in the year ending July 1, 2013 boosting its total population to 2,195,914. According to the U.S. Census Bureau the city of Dallas grew by 15,976 people to have a July 1, 2013 population of 1,257,676. Fort Worth ranked 13th nationally among cities with the largest population gain over the year before: 14,643. The city’s population as of July 1, 2013, was 792,727, up from 778,084 in 2012. Austin continues to grow increasing from and estimate population of 864,407 on July 1, 2012 to a population of 885,400 as of July 1, 2013. San Antonio grew from 1,383,641 on July 1, 2012 to an estimate population of 1,409,019 on July 1, 2013. 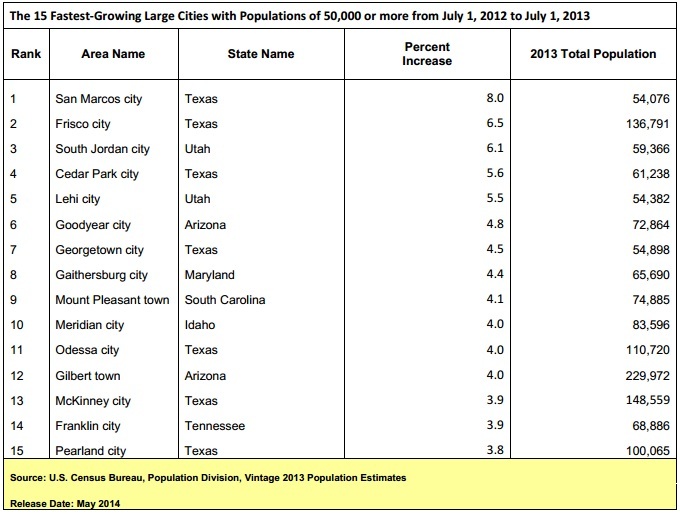 El Paso grew from a population of 674,124 on July 1, 2012 to an estimate population of 674,433 on July 1, 2013. Salt Lake City grew from a July 1, 2012 population estimate of 189,462 to a population of 191,180 by July 1, 2013. Burlington is estimated to have declined in population from 42,297 on July 1, 2012 to 42,284 by July 1, 2013. Virginia Beach remains the largest city in the state and had a population of 445,378 on July 1, 2012 and is estimated to have grown to a population of 448,479 by July 1, 2013. Norfolk is estimated to have grown from 246,007 on July 1, 2012 to 246,139 by July 1, 2013. Richmond continues to grow from a population of 210,857 on July 1, 2012 to an estimated population of 214,114 by 2013. The city saw its largest population in 1970 when it reached 249,621. In 2000 the city had declined to a population of 197,790. Alexandria is estimated to have grown from 146,839 on July 1, 2012 to a population of 148,892 by July 1, 2013. 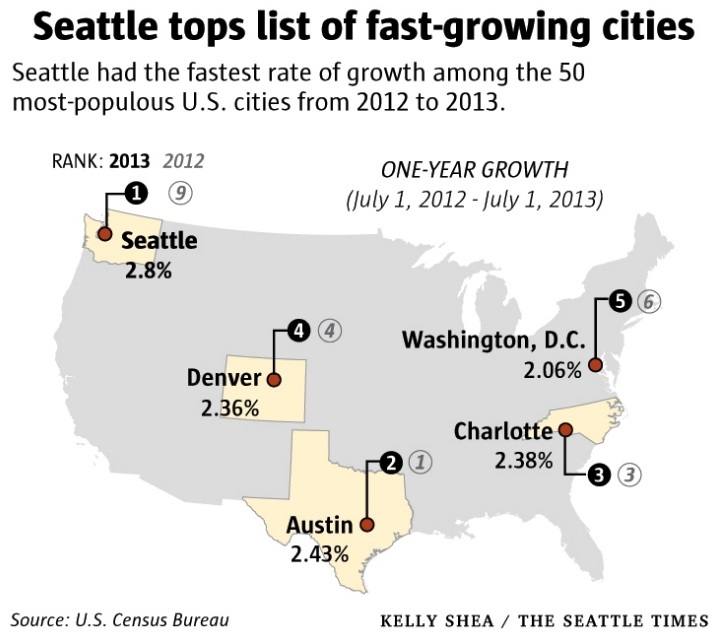 Tacoma is estimated to have grown from 202,308 on July 1, 2012 to a population of 203,446 by July 1, 2013. Charleston is estimated to have decreased in population from 51,014 on July 1, 2012 to 50,821 by 2013. Milwaukee was home to an estimated 599,164 people for the year that ended July 1, 2013, a boost of 762 residents over the previous 12 months. Milwaukee was the nation’s 31st-largest city. Milwaukee had a population of 741,324 in 1960. Madison is estimated to have grown from a population of 240,441 on July 1, 2012 to a population of 243,344 by July 1, 2013. Cheyenne is estimated to have increased in population from 61,600 on July 1, 2012 to 62,448 by July 1, 2013.